A too close flyby wil be made by Near-Earth asteroid 2005 YU55, will pass within 0.85 lunar distances from the Earth on November 8, 2011. The upcoming close approach by this relatively large between 110 - 240 meter-sized, C-type asteroid. Is one of the hazardous asteroids that can hit us in the future. The asteroid 2005 YU55, is a round mini-world that is about 110 to 240 meters in diameter. 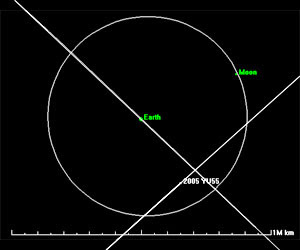 In November, this asteroid will approach Earth within 0.85 lunar distances. Asteroid 2005 YU55 was discovered by Spacewatch at the University of Arizona, Tucson’s Lunar and Planetary Laboratory on Dec. 28, 2005. This “potentially hazardous asteroid ” will be so close that several observatorys will pay close attention on the approach to Earth, specially to predict future close approaches and determine if it can put our planet at risk of being hit. This will be the closes approach of an object this big until 2028-when asteroid (153814) 2001 WN5 will pass to within 0.6 lunar distances. In case you ask if it hits , what happens? HOW FAST IS 2005 YU55 TRAVELING ?